Sounds nummers. I will make a point of going. 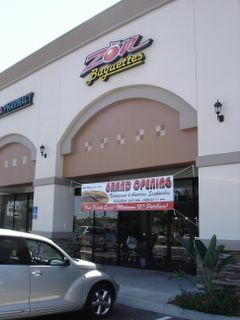 I guess our family will have lots of new places in Tustin to try on our next visit. The only one we went to last time was the place with the fish tacos. I couldn't agree with you more about your assessment of the baguettes from Lee's Sandwiches. They are "too" crusty and way "too" tasteless. I think that making baguettes short and squat helps to promote interior fluffiness and golden-brown crustiness. 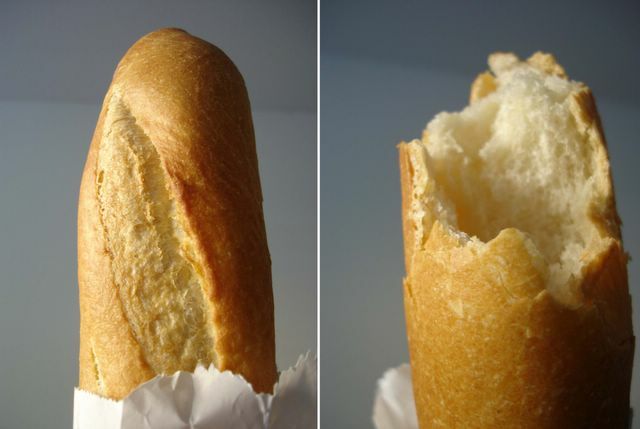 Lee's Sandwiches makes those long and skinny baguettes, which are dried out and tooth-shattering. Also, yea! I am glad that you got a little surprise in getting a free grilled chicken upgrade! Just for that, I'd return to this place!! Hi Elmo - You know, it's really hard to say bad things about a $2 sandwich...... It's great that you have diverse choices for food. I LOVE banh mi's but haven't really found a great one in Los Angeles...can you recommend a good one somewhere near Pasadena? Funny enough I tried the fish tacos place (Los Cotija's) for the first time last week. I'll probably blog about that experience next. Also, the other problem with Lee's, I think, is that those machines overwork the dough to the point that its overrun by gluten. This makes for hard and leaden bread...although as a wiffle bat, Lee's baguettes fare quite well. Yup. This $2 sandwich was filling, good, and cheap. It's a few more cents more expensive than Banh Mi Che Cali (which remains my favorite), but hey that's a few cents I'll spend if I can avoid 405 traffic at rush hour. Even with the few slices of char siu in the BBQ Pork sandwich, I was quite happy and sated. 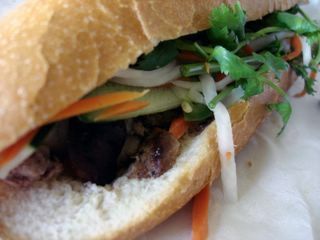 I'd recommend Banh Mi Che Cali (which I believe is in Rosemead). It's perhaps the best in Little Saigon, and I've heard the branch in SGV is just as good. isn't "jambon" french for ham? sounds great. i love all your reviews!! tried Zon Baguettes today... had their Special Combo. You beat me there. I had every intention of going on Sunday but ended up being dragged to eat Mexican with some friends. I was totally craving a banh mi, next time. So my sister and i were deciding what to eat for dinner. She's REALLY picky and i can't take her anywhere new unless she's in the mood for something that i crave (happens like once in a blue moon). I said "What some banh mi?" She said "NO!" Guess I'll have to try this place by myself one of these days. lol i meant "want" not "what"
I talk fobby even though i was born here!! Tustin is truly a great secret for food. Between Honda-Ya and a ton of other places I have seen, I am constantly amazed that it gets overlooked. You're right! Jambon is French for ham! Makes sense now when I think about it. Pate is the best! 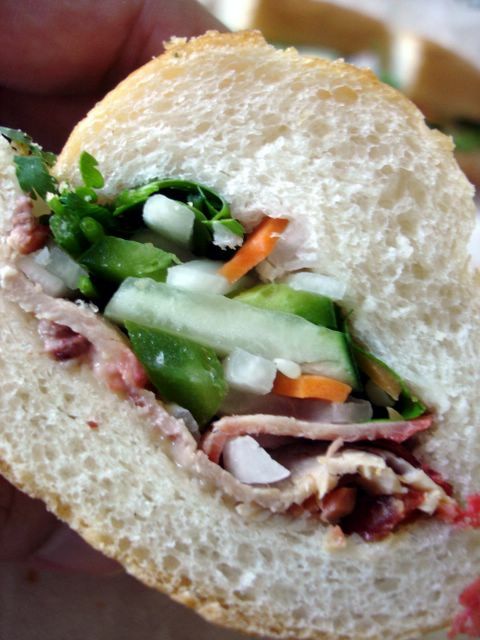 Banh Mi Che Cali's sandwiches are redolent of the stuff...which is why I love 'em. Too bad Zon's a little stingy with it. Perhaps they're afraid the people in the neighborhood aren't ready yet. This place is great when those banh mi cravings hit and you don't want to get on the 405 to quench it. It doesn't take the place of Banh Mi Che Cali, but it sure has made Lee's nothing but a distant memory in my mind. I hope you do get to try it soon. If not for anything else but to get the free baguette with a $5 minimum purchase. Next time you come down, I'm going to treat you to Zon's or better yet Banh Mi Che Cali, time permitting. I don't know how far you live from Tustin, but with Honda-Ya, Dosa Place, Noodle Avenue, Zov's, Tropika, Waikiki Hawaiian Grill, and countless others, I'd drive from as far as La Habra to eat in this city. Thankfully, I live only a few minutes away. I was a Lee's fan until they started to skimp on the meat. Banh Mi Cali is my favorite/cheapest eats and of course extra pate, please! There's a to-go place on McFadden? What's it called? And where? I'm curious. I concur. 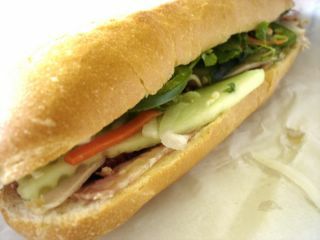 Even after the $0.25 price hike, Banh Mi Che Cali is still the best bargain and the best tasting! Ohhhh I am going today I can't wait, it's right near my office! Hope you like it! BTW, the Chocolate Smoothie is pretty refreshing in this weather, but the Honeydew Smoothie was a bit too sour. Lee's always cuts up the roof of my mouth - not a delightful culinary experience. I usually order two, but the 2nd one is left for later eating due to injuries. I prefer Baguette Express on Valley Blvd (Rosemead) over Lee's and Mr. Baguette because the bread is softer. Added to that Lee's really skimps on the fillings. One thing I do love at Lee's are those deep fried hot wings. Except, I think the last time, they were the cause of really bad food poisoning. Thanks for the recommendation, this place is awesome! Best baguette I've had outside of Paris. I stopped by for lunch and found that they had pre-package vermicelli noodles with egg rolls and grilled bbq pork (otherwise known as Bun Cha Gio). It was ready to go with no wait so I tried it and it was pretty good even with the soggy eggrolls. It's not on their menu but they'll make it for you if you ask. I believe it was about $4. It's good ain't it? It's best to eat their sandwiches and baguettes in store, as they degrade exponentially the longer you wait. I had it for lunch the other day and the crisp, hot crust and supple crumb hit the spot. My favorite is the Vietnamese meatball. Their other items are good too, but the BBQ pork is still skimpy...really skimpy! Excellent tip! I might ask for them to make me a fresh one when I lunch there next.